African Philosophy and Environmental Conservation is about the unconcern for, and marginalisation of, the environment in African philosophy. The issue of the environment is still very much neglected by governments, corporate bodies, academics and specifically, philosophers in the sub-Saharan Africa. The entrenched traditional world-views which give a place of privilege to　one thing over the other, as for example men over women, is the same attitude that privileges humans over the environment. This culturally embedded orientation makes it difficult for stake holders in Africa to identify and confront the modern day challenges posed by the neglect of the environment. In a continent where deep-rooted cultural and religious practices, as well as widespread ignorance, determine human conduct towards the environment, it becomes difficult to curtail much less overcome the threats to our environment. It shows that to a large extent, the African cultural privileging of men over women and of humans over the environment somewhat exacerbates and makes the environmental crisis on the continent intractable. For example, it raises the challenging puzzle as to why women in Africa are the ones to plant the trees and men are the ones to fell them. Contributors address these salient issues from both theoretical and practical perspectives, demonstrating what African philosophy could do to ameliorate the marginalisation which the theme of environment suffers on the continent. Philosophy is supposed to teach us how to lead the good life in all its forms; why is it failing in this duty in Africa specifically where the issue of environment is concerned? 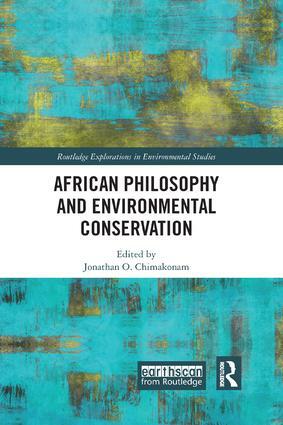 This book which trail-blazes the field of African Philosophy and Environmental Ethics will be of great interest to students and scholars of Philosophy, African philosophy, Environmental Ethics and Gender Studies. Prof. Bruce B. Janz (University of Central Florida, USA), "Peripherality and Non-Philosophy in African Philosophy: Womanist Philosophy, Environmental Philosophy and Other Provocations." Prof. Alexander Animalu & Mr. Jeff Unegbu (University of Nigeria Nsukka, Nigeria), "Gaia Hypothesis from an African Perspective." Prof. Thaddeus Metz (University of Johannesburg, South Africa), "How to Ground Animal Rights on African Values: A Constructive Approach." Dr. Kevin Behrens (University of the Witwatersrand, South Africa), "An African Account of the Moral Obligation to Preserve Biodiversity." Prof. Olatunji Oyeshile (University of Ibadan, Nigeria), "Transformation of Urban Space in South-West of Nigeria, 2011 to Present: Ethical Issues in Development and Aesthetics"
Prof. Ebunoluwa Oduwole & Dr. Fayemi Kazeem (Olabisi Onabanjo University & University of Lagos, Nigeria), "Animal Rights vs. Animal Care Ethics: Interrogating the Relationship to Non-Human Animals in Yorùbá Culture." Prof. Workineh Kelbassa (Addis Ababa University, Ethiopia), "Women and the Environment in Africa." Prof. Oladele Balogun & Dr. Fayemi Kazeem (Olabisi Onabanjo University & University of Lagos, Nigeria), "Women Identities in African Environmental Ethics: A Conversational Engagement." Dr. Jonathan Chimakonam (University of Calabar, Nigeria), "Ohanife: An Account of the Ecosystem based on the African notion of Relationship." Dr. Angela Roothaan (Free University Amsterdam, Netherlands), "Hermeneutics of Trees in an African Context: Enriching the Understanding of the Environment ‘for the Common Heritage of Mankind.’"
Victor Nweke (University of Calabar, Nigeria), Global Warming as an Ontological Boomerang Effect: Towards a Philosophical Rescue from the African Place." Dr. Ralph Madu (Catholic Secretariat of Nigeria), "Laudato Si and the Ecological Crisis." Dr. Ada Agada (University of Nigeria, Nsukka, Nigeria) "Catalyzing Climate Change Action in Nigeria: Moderate Anthropocentrism and the African Perspective of the Cosmos". Prof. Fainos Mangena (University of Zimbabwe, Zimbabwe) "Zimbabwe’s Environmental Crisis: Questioning Ubuntu?" Francis Diawuo and Abdul Karim Issifu (University for Development Studies, Ghana and University of Cape Coast, Ghana) "Exploring the African Traditional Belief Systems (Totems and Taboos) in Natural Resources Conservation and Management in Ghana"
Jonathan Okeke-Mpi Chimakonam is a senior lecturer at the Department of Philosophy, University of Calabar, Nigeria and a Research Fellow at the Department of Philosophy, University of Pretoria, South Africa.